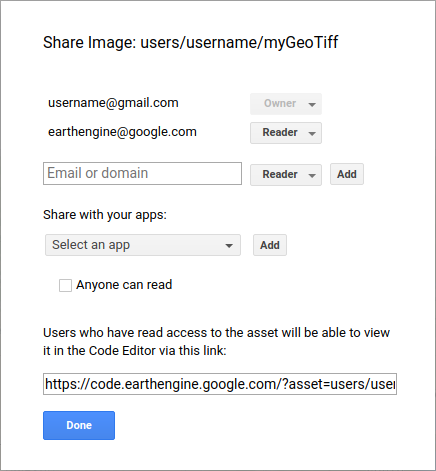 To upload and manage geospatial datasets, use the Asset Manager in the Code Editor. The Asset Manager is on the Assets tab at the left side of the Code Editor (Figure 1). 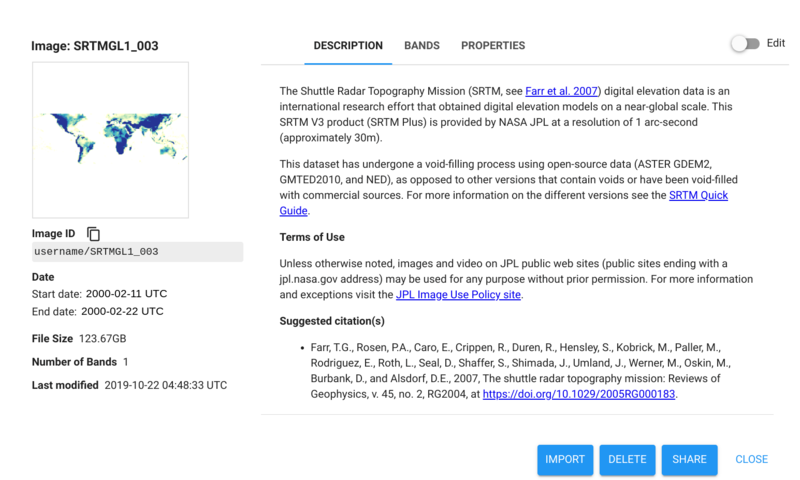 See Importing Raster Data for instructions on uploading raster (image) data and Importing Table Data for instructions on uploading table data. Your assets are initially private, but may be shared with others. See the Sharing Assets section for details. Datasets uploaded through the Asset Manager become private assets in a folder owned by your user account. The space allocated to each user account for storing assets is limited by a quota. Quota usage is measured by the total number and the compressed size of stored assets. To see how much of your asset quota is in use, hover over users/username and click the data_usage icon. Figure 1. The asset manager. You can import an asset to your script by hovering over the asset name in the Asset Manager and clicking the arrow_forward icon. 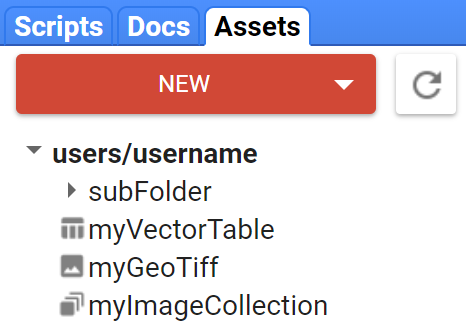 Manage assets in your user folder by clicking on the asset name. A dialog will present information about the asset, including a preview thumbnail, an editable list of metadata properties, and buttons to import, share, or delete your asset (Figure 3). Note that properties with names prefixed by system: are read-only (except for the standard time properties), and that properties cannot be edited on collections. Use the + New folder button to add subfolders to your user directory. Use the + New image collection button to create an ImageCollection in your user folder. Move images and collections into folders with drag and drop. Copy images into an image collection by dragging them to the collection. Click on the image collection to open a dialog that will let you add and remove images from the collection. Figure 3. Asset information dialog. You can click the Delete button to delete the asset. It will ask you to confirm whether you really want to delete the asset. Use the delete button with caution. If you unintentionally delete an asset, you will have to create it again. Click the Share button to configure access to your private assets. You can also share by hovering over the asset and clicking the share icon. The sharing dialog (Figure 4) lets you configure read or write access for individuals or groups (specified by a domain). To make an asset public, check the 'Anyone can read' box. Any user with write access to a folder will be able to delete assets from it. Figure 4. Asset sharing dialog. Last updated June 12, 2017.